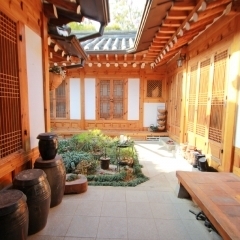 A 100-year-old traditional hanok in Bukchon Hanok Village was remodeled to make it easier for travelers to stay. It was opened on March 26, 2006. All buildings in the house are made of natural wood, bamboo, and yellow clay and come out in far-infrared rays. I will. It is a special place where you can experience Korean traditional images. The hotel is located close to the popular Gyeongbokgung Palace, Changdeokgung Palace, Insadong, Samcheongdong Myeongdong, Namdaemun Market and Dongdaemun Market. All House has recently completed a facility that has been inherited for generations through modern interiors. We wish you a happy memory with the scent of the owner of your home. The large room is available for up to 6 guests (5 persons). (4.4m X 3.5m) You can solve everything for your stay in the hotel, including private bathroom, high-speed wireless internet.